Flowering ground covers are considered something of a Holy Grail for the landscaper. They offer both beauty and function, giving your yard color while simultaneously helping you fight weeds and control erosion. If you are seeking a solution for a problem area, flowering ground covers can get the job done without making you compromise on display value. Many flowering ground covers bloom for only a short period of time during the spring or summer. Consequently, the best examples have nice foliage in addition to flowers, so they look good throughout the growing season. Most flowering ground covers should be planted in a spot with full sun for best performance, but there are a few good options for areas with partial shade. You know that spring is truly underway when you see slopes covered with ground phlox (Phlox subulata) flowers. 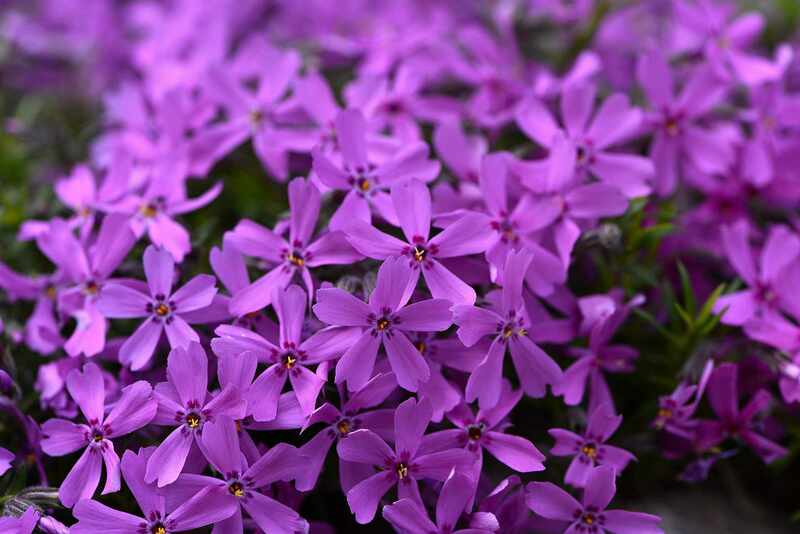 This type of phlox is known either as "creeping phlox" or "ground phlox" to distinguish it from the much taller perennial known as "garden phlox." There are a number of colors to choose from, and many gardeners plant ground phlox in color combinations. One popular option is a pink-and-white combination reminiscent of Good & Plenty candy. Hosta is thought of mainly as a foliage plant, but some types can also provide an option for a flowering ground cover, thus the old name "plantain lily." Hosta plantaginea even bears fragrant flowers. Still, hosta does not win any prizes for its flowers; it is the leaves of hosta that people really love, coming as they do in a number of colors and sizes. As an added bonus, some but not all types of hosta like shade. The floral display of candytuft plant (Iberis sempervirens) is truly dazzling, with its numerous brilliant white flowers. You can prune it back after it is done blooming to prevent it from becoming leggy. On the other hand, if you are planting candytuft behind a retaining wall, legginess may be desirable, as the foliage can spill dramatically over the wall (although you may have to tidy them up a bit by removing older leaves). In other situations, though, pruning is recommended. Once its spring flowers have come and gone, only the new foliage of candytuft will give this flowering ground cover any aesthetic value. Long-flowering ground covers are a dream come true. While most flowering ground covers bloom for an extended period of time, purple or "hardy" ice plant (Delosperma cooperi) is an exception. Ice plant requires a soil with outstanding drainage to live up to its "hardy" label. And a surprising label it is, considering that this long-flowering ground cover hails from South Africa. While it is tempting to think it receives its name from that hardiness, it actually gets its name by the way it looks. When the sunlight hits the ice plant's foliage just right, the succulent leaves look like they are bejeweled with ice crystals. In spite of its hardiness, ice plant is not the type of flowering ground cover that a northern gardener should rely on for year-round erosion control. Instead, use ice plant to dress up an area for the summer, planting it in a place where you will be able to enjoy this long-flowering ground cover to the fullest. The only characteristic keeping sweet woodruff (Galium odoratum) from being an outstanding flowering ground cover is the fact that it dies back to the ground in winter (the roots do survive underground, though). So it offers no visual interest for the winter months. Sweet woodruff has white flowers and can spread beyond the space allotted to it in a garden. However, this is usually a beneficial trait for ground covers, as plants that are not ​aggressive spreaders can be difficult to establish as ground covers. It can be especially tough to establish a flowering ground cover under a tree, but sweet woodruff performs very well under trees. Fortunately, for those with shady patches in need of a flowering ground cover, liriope can be grown in partial shade. Liriope spicata, or the lilyturf plant, is treated as an ornamental grass by some, even though it is actually a type of lily. Its common name embodies this confusion: Is the plant a lily or a grass? Take advantage of lilyturf's identity crisis and enjoy both its blooms and its attractive, grass-like leaves. One common name for Aurinia saxatilis is "yellow alyssum," but do not confuse this flowering ground cover with the annual that goes by the name, "sweet alyssum." Yellow alyssum is a perennial. To avoid confusion, perhaps a better common name for this perennial ground cover is "basket-of-gold." Whether you love it or despise it, there is one thing you can say for Vinca minor: It is a vigorous grower. This vine is a flowering ground cover that will thrive in shade, and there is no denying that vinca bears an attractive flower. So why would anyone despise this plant? Vinca is a victim of its own success. It spreads so well as a ground cover that some people find it too aggressive (indeed, it can be an ​invasive plant). Some types of thyme ground cover (Thymus) flower profusely, albeit minutely. An example is the ​so-called "red" thyme, although its flower color is really more of a pink or lavender. A bonus in using thyme ground cover is that it is one of the fragrant plants, although the intensity of smell will depend upon the variety (the smell comes from the leaves and not the blooms). Rockspray cotoneaster (Cotoneaster horizontalis) is a shrub, but its horizontal growing habit invites use as a tall ground cover of sorts. It does not stay nearly as short as another "horizontal" plant, Juniperus horizontalis Wiltonii. Nevertheless, cotoneaster can be useful when you wish to cover ground by employing a mixed planting in which the heights are staggered. This can produce a more interesting planting than one with a single type of ground cover. If the idea appeals to you, remember to grow the cotoneaster in the back row so that it does not shade the shorter ground covers. While cotoneaster does flower in the spring, it is not grown primarily for its flowers but rather for its attractive berries that succeed the flowers. Its leaves are also quite colorful in fall. If your goal is a low-maintenance yard, yellow archangel's drought-tolerance (once established) could be a major selling point. Unfortunately, these fine features will be negated for some by its aggressiveness. Yellow archangel, which can be grown in USDA plant hardiness zones 4 through 9, has wound up on many invasive plants lists in the U.S. It is not native to North America; rather, it hails from Europe and Western Asia. Such aggressiveness is a double-edged sword in landscaping. On the one hand, you want a ground cover to spread across a patch of bare ground, thereby aiding you in weed-control. On the other hand, you do not want the plant to spread to a place in the landscape where you do not wish it to grow. Dragon's Blood stonecrop (Sedum spurium "Dragon's Blood") is related to Autumn Joy. Both exhibit succulent stems and leaves characteristic of stonecrops. But unlike Autumn Joy, Dragon's Blood stonecrop hugs the ground. Stems, leaves, and flowers can be red, depending on the variety of Dragon's Blood that you plant and the conditions in which you grow it. Although this plant is listed as a flowering ground cover, do not go out of your way to grow it unless you think you will appreciate its stems and foliage. Its flowers do not last long enough (and are not large enough) to qualify as an outstanding feature. But its stems and foliage can look quite nice in rock gardens. Angelina sedum (Sedum rupestre 'Angelina') is a stonecrop plant that produces a yellow flower. And while its flower head is not, in itself, unattractive, many gardeners find something awkward about the way it hovers so far above this ground-hugging plant. But do not let that stop you from growing Angelina sedum. If you agree that the plant's floral display is not its best asset, just cut off the flowers and bring them inside and display them in a vase. Angelina sedum is grown for its succulent foliage, which is chartreuse most of the year with hints of pink (or even red) in winter. If you dissect the botanical name of bugleweed, Ajuga reptans, you learn that reptans (Latin for "creeping") is a warning. This is one plant that you may have difficulty controlling, it has a tendency to be an aggressive spreader. 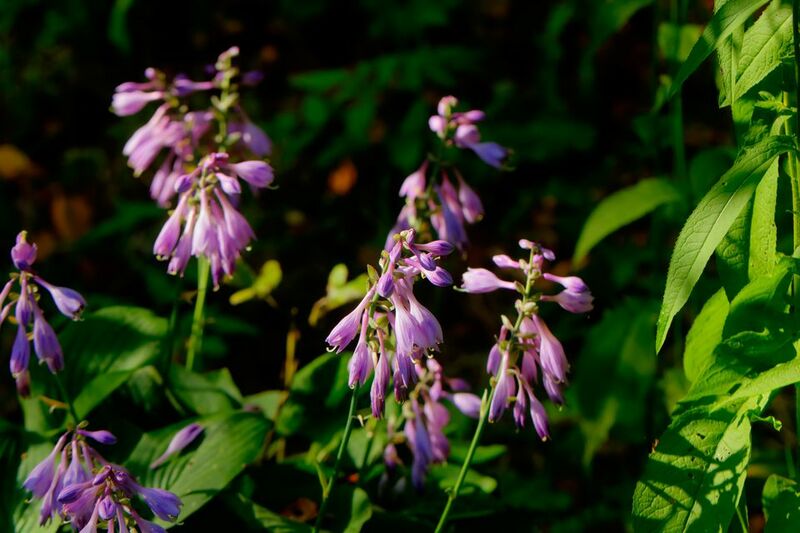 Bugleweed is capable of spreading fast and choking out everything in its path. Consider yourself warned. Growing this plant in your landscape is not usually advisable. A shade ground cover, Pachysandra terminalis can also tolerate dry shade. Pachysandra can be used under trees, where there is usually a lot of competition for water. As a bonus, this shade ground cover is also a deer-resistant plant, which is probably why you will see a lot of pachysandra if you drive through the state of Connecticut, where there are a lot of deer. There are relatively few large, vigorous, hardy ground cover plants that are both good bloomers and shade-tolerant. Climbing hydrangea vines are among them. Unlike most ground covers, these hydrangea vines are true climbers. But that does not mean that they cannot function as ground cover plants as well. Climbing hydrangea vines (Hydrangea anomala ssp. petiolaris) are a very popular choice when gardeners need a big plant that will tolerate shade. In fact, in hot climates, hydrangea vines actually prefer a location with at least partial shade. Elsewhere, they will do just as well in more sunny areas. The plants will bloom more profusely if they receive optimal sunlight. Although it does send up a flower stalk (and a tall one, at that), lamb's ear (Stachys byzantina) is grown more for its foliage than for its flowers. Lamb's ear bears silver foliage. The leaves are soft and fuzzy to the touch. Cerastium tomentosum, better known as "snow-in-summer," is a full-sun ground cover featuring two desirable traits. It is a flowering ​groundcover with white blooms (as its common name suggests), and, like lamb's ear, it has silvery leaves. Snow-in-summer has one downfall: It is a short-lived perennial. Whether wild violets (Viola sororia) are valued as flowering ground covers or despised as common lawn weeds is really a matter of opinion. You will consider them the latter if your aim is to grow a well-manicured lawn. Understandably, though, lovers of wildflowers are fond of the plants. If you fall into the latter camp, be sure to group a large number of these plants together to create the best possible display. They are small plants with small flowers, so a stray wild violet growing here or there does not make much of an impact.